The food of Portugal is “invariably” delicious, yet “ours is one of the most overlooked cuisines in Europe,” says Nuno Mendes in My Lisbon (Ten Speed Press). Its time may have arrived, though, because a new generation is rediscovering Lisbon, and talented young chefs have been inspired by that fresh energy to embrace the country’s rich food culture. 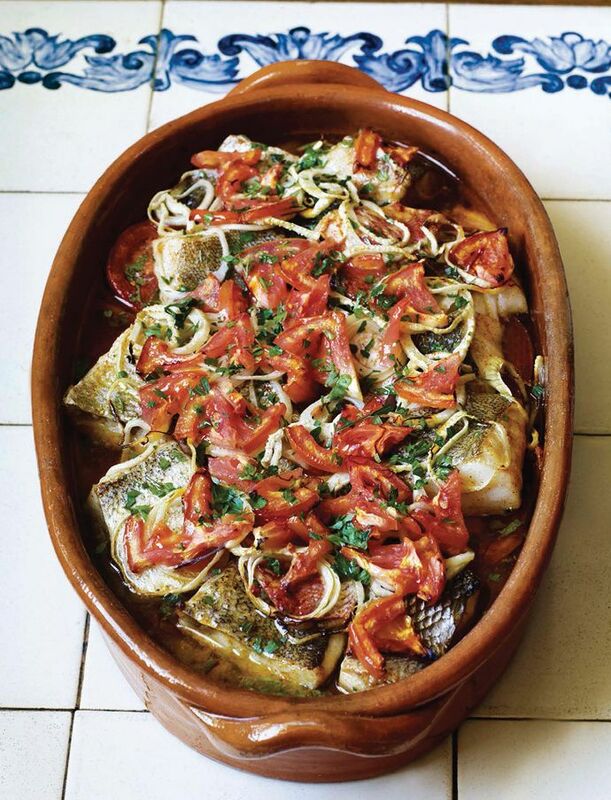 The Portuguese simply love to eat; “we’re happiest sitting round a table and eating with family, friends, or new guests, passing around platters of goodness.” The dish below, a baked fish stew, is perfect for that kind of dinner, one that starts past 8 and runs until nearly 12. It’s simple to assemble, yet incorporates some of the flavors—smoky paprika, peppery olive oil, garlic, and tomatoes—that have been central to Portugal’s cuisine since our adventurous 15th- and 16th-century seafarers began bringing home spices and turning Lisbon into the richest city in the world. Place saffron in a small bowl and pour 1 tbsp boiling water over it. Set aside. Rub cut garlic clove all around the inside of a shallow baking dish, ideally one with a lid. Arrange half the potatoes in bottom of dish and dot with half the butter. Season potatoes, and each succeeding layer, with salt, pepper, and paprika. Follow the first potato layer with a layer of half the tomatoes, onion, and fennel, then a layer of the remaining potatoes. Create a layer of fish, then one of the remaining onion and fennel, and finally of the remaining tomatoes. Dot rest of butter on top and drizzle with olive oil. Mix saffron with wine and pour over the dish. Allow to marinate for 1 hour. Preheat oven to 355. Cover dish with a lid or foil and bake for 20 minutes. Remove covering and bake another 20 minutes. Sprinkle with chopped parsley. Serves 4.